Note: There is also a slightly out-of-date tutorial on this topic at Tracking Curves. It contains some info, particularly about link/export, which hasn't yet been added to this new tutorial. There is also another very out-of-date tutorial for synfig 0.61.08. This tutorial will demonstrate how to make an object follow the path of an arbitrary curve, rotating to face the direction of travel. 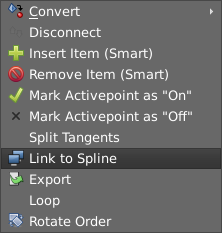 click the "Make Spline" icon in the bottom left of the Tool Options Panel to create the spline. draw an arrow or whatever, pointing to the right. 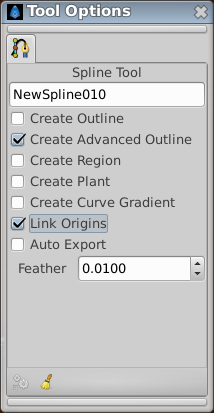 From the context menu that pops up, select "Link to Spline"
We can now animate the arrow. turn on Animate Editing Mode by clicking the icon in the bottom right of the canvas window. Try "<Caret Menu> → <File> → Preview" to watch the animation. By default, the arrow travels the whole spline with a constant velocity, independently of the spline structure. If you select the group layer and look at the Parameters Panel, then you'll see that its Origin parameter is converted to "Spline Vertex" type. This is done automatically when you do "Link to Spline" action. You can disable the "Homogenous" subparameter and then the speed of the arrow will depend on the spline structure - it will take the same time to move along each segment of the spline. So if there's a long straight part then a bendy complex part, the arrow will move much faster along the straight parts (since there will be less vertices in that part). In physics terms, the linear velocity (that is, the speed over the spline) is not constant. For illustration of the "Homogenous" effect see this demo. Synfig forum : animate a "travel path"
A video link showing the explanation of this page. This page was last modified on 23 February 2019, at 12:54.